Over 25 years ago, a tradition was born in Paris – a tradition that pays tribute to the elegance, glamour, and rich history of the city. But what started as a quaint dinner for an elite guest list in the bustling city of lights, has now become one of the most sought-after dining events in more than 40 cities across 5 continents. Mysterious? Yes. Intriguing? Definitely. 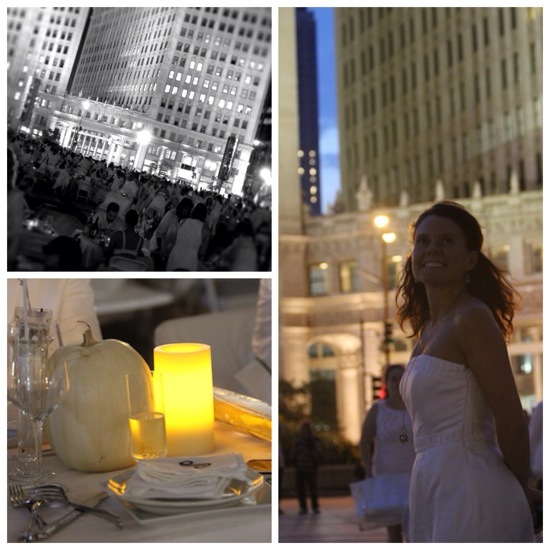 The Guest List and Location: Groups of people – hundreds to thousands – many whom have never met – gather in secret locations all over a major metropolitan city. They bring their own tables, chairs, and food, all the while anticipating what is before them. Eventually, the groups travel to an uber secret location (that is only revealed at the very last minute), where together they enjoy music, lively conversation, and a three-course dinner, with wine and champagne. The Dress Code: All dinner guests are asked, and expected, to wear all white – not winter white, not ivory, or cream…..WHITE. The women wear lovely dresses and pant suits, while the men look quite dapper in their white suit coats, vests, and hats. The dinner itself has a dress code, with accompaniments being white – complete with white linens, dishes, cloth napkins, candles, and more. 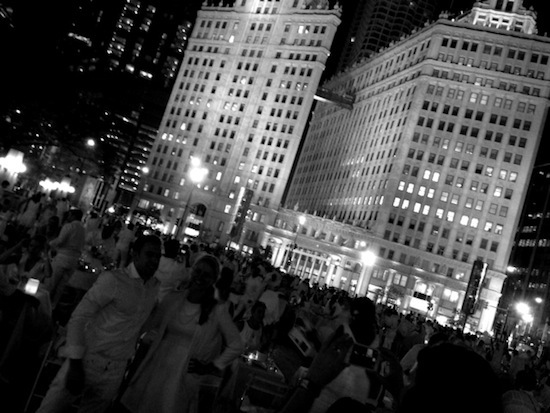 The Experience: But this event is more than just about wearing white or having a few cocktails in the city. It is a magical destination that only appears once a year, out of the sunset-laden sky. 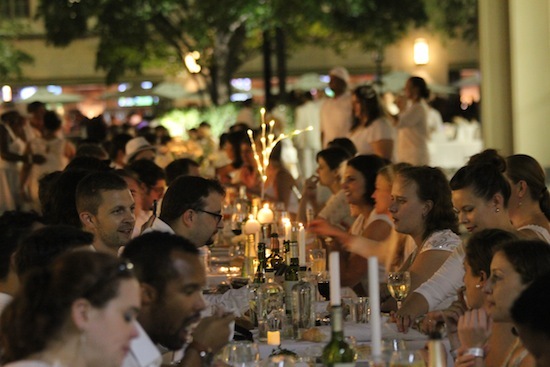 And as the magic begins to unfold, those fortunate enough to be invited spend hours soaking in the warmth of candle light, savoring French-themed dishes in the open air, and making new friends from all walks of life. 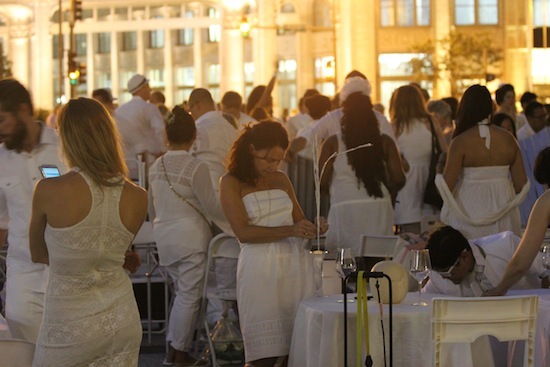 I was one of these very guests during last week’s Dîner en Blanc Chicago 2013. From the moment I stepped foot into Pioneer Court in Chicago (near the Tribune building), I was amazed at the immense coordination that went into the event (thanks to Roger and team!). Although my husband and I were one of the first few guests to arrive, we were soon joined by a thousand of our closest friends. 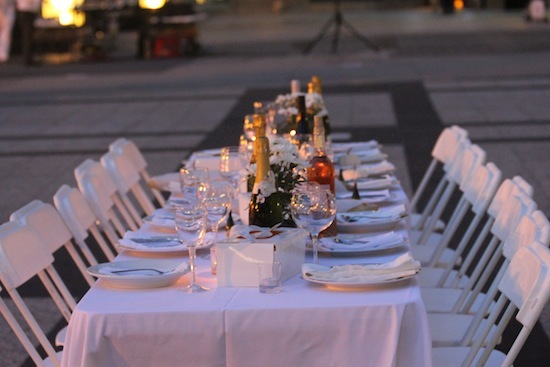 Within minutes, our fellow guests had created the largest outdoor, formal dining experience I had ever witnessed. We carefully set up our tables and chairs, lined them with white table cloths, chair covers, flowers, and lights. Soon after, you could hear the unmistakable sound of wine bottles being opened and champagne corks being popped. The meal, placed on real dishes, began with a signal of napkins waving in the air. Throughout the meal, diners would go from table to table, engaging in quick conversations, or remaining in their chairs, enjoying the company of those around them. Others would spring up for a quick dance, photo, or to refresh their drink from a sharing neighbor. 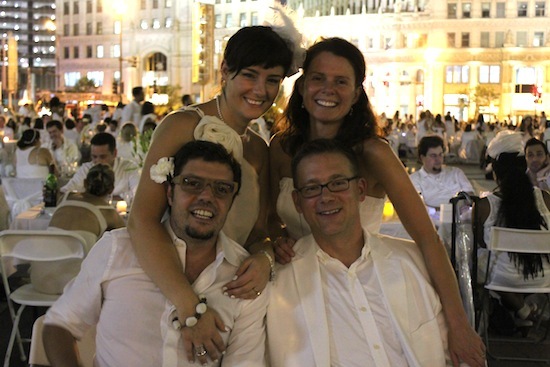 My husband and I greatly enjoyed our conversation with the couples on either side of us: Chris and Habby – friends sharing the same adventurous-foodie interests, attending for the first time; and Chiara and her husband Marcello, expats from Italy, truly savoring a night (and an anniversary!) out on the town while the grandparents watched over their young daughter. The stories and laughter we shared made it seem like we were long-lost friends, but only having just met. I spent hours if not days reliving the event in my mind and retelling the details to whoever would listen. As I pause, even now, to catch my breath, gather my thoughts, and relish the memory – one powerful word comes to mind……Enchanting.